Carbon folding boat gangway 216 cm of lengthExit Engineering is a leading manufacturer of carbon fibre boat gangways and sailing boat steering wheels. ... ihre clevere Kombination von Carbon Bauteilen mit hochwertigen mechanischen ... Die Gangway ist zugleich das Entree und die Visitenkarte Ihres Bootes. Find all the manufacturers of Folding gangway and contact them directly on Nauticexpo. Sturdy anodised aluminium construction,with non-slip coating. UV resistant. Collapsible in 3 elements. For use on most boats (sailing or motor boats). 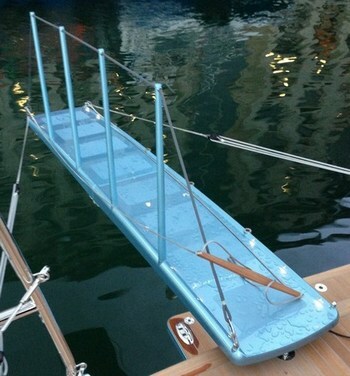 Removable and folding gangway for the boarding on yachts and in boats in general. Very light and therefore easy to stow. The other types of gangway supplied by FEMstrutture are showed on the left. Pivoting pin on the boat side. Possibility to insert the stanchions on both the sides. Fast lock system of the stanchions. Safety factor more than 3 on the ultimate stress of the materials. Weight about 7 Kg for the model 2200 and about 11 Kg for the model 2850. Fig 2 - Automatic folding gangway with remote control. When the gangway moves down toward the dock, this system locks automatically the horizontal rotation in the position chosen . The descent is not instable. the locking system has also a valence of anti-theft. Being the gangway locked to the horizontal rotation, on the dock side the wheels will be pivoting. System of automatic closing. It is composed by a kinematics and it is operated electrically to permit the opening / closing of the gangway by pushing a wired button or a remote control.